DIRECTOR’S NOTESStephen Schwartz and Roger Hirson created a pleasant little musical called The Adventures of Pippin in the early 1970s. But after director Bob Fosse was through re-writing it, it was a cynical, sexual, slickly decadent morality play. When Schwartz raised too many objections to Fosse's changes, he was banned from rehearsals. But after it closed on Broadway, Schwartz had his ideas restored to the script and many of Fosse's changes taken back out, for future productions. New Line's production returns to Fosse's original dark vision of Pippin's quest for fulfillment and identity. Pippin is a young man with no idea what he wants from his life. Luckily, a traveling troupe of players appears who have helped other young men in Pippin's predicament. They offer to play out his life for him – with colored lights, music and dance, comedy and drama – so that he can try things in his search for fulfillment. With the players' help, his quest becomes a roller coaster ride of razzle-dazzle entertainment and seductively dangerous excesses. What Pippin doesn't realize though, is that the players' only goal is for him to do their Grand Finale. They make sure he fails at everything so that the finale will be his only remaining opportunity to find perfection. But it's not until the big moment arrives that they tell Pippin what he has to do. They want him to get in a box and set himself on fire – “a glorious synthesis of life and death, and life again!” They want him to commit suicide, live on stage. 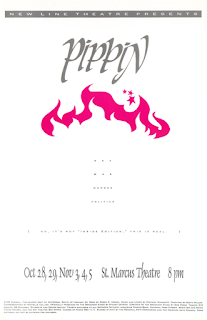 Up until that point, Pippin is a morality tale with the unpleasant lesson that complete fulfillment doesn't exist. Like John Hinckley and Lee Harvey Oswald in last season's Assassins, Pippin thinks the world owes him happiness. When he can't find it, he's angry, confused, bitter. He's told he has to settle for an average life and the fulfillment of none of his ideals. But when Leading Player says to us, “Why, we're right inside your heads,” suddenly it's a whole new ballgame. The players are in Pippin's mind. In fact, the whole show is Pippin's fever dream, a hallucination full of the magic he never found in his life, all happening in the moment before he kills himself. His family is populated by perverse stereotypes, his fantasies filled with frightening characters of his own creation. In reality, Pippin has been causing himself to fail at everything throughout the show, and he has been convincing himself to commit suicide. We wonder why murder and suicide among teenagers continues to increase. Maybe Pippin knows why. We create outrageous expectations for our young people and then sabotage their chances at attaining them, asking them to grow up faster with each generation. We rarely offer them role models and we destroy the ones they have, people like O.J. Simpson, Michael Jackson, Clarence Thomas, even Captain Kirk. We tell them they can have anything they want, but it's not true. As rock star Kurt Cobain discovered recently, when everything else is trashed, all that's left is the Grand Finale. If you know Scott, you know of his insistence that his actors go “over the top” in their performances. I never really had a problem with that notion until I did Pippin. Scott wanted me to play Pippin like a spoiled-rotten, annoying kid. I would like to repeat loud and clear for those of you that saw Pippin – SCOTT MADE ME DO IT! I have never really fought Scott on any of his directorial decisions, but this one drove me crazy. No matter what I did, it wasn’t big enough or wasn’t “animated” enough. To add fuel to the fire, I had been suckered by Leo Schloss and Scott to quit smoking during the length of our rehearsal schedule and performances, so my voice had a fighting chance at hitting the demanding vocal part. (Side note: I said “suckered” because Leo promised to quit as well so I wouldn’t be going through hell alone, and I later found out that he hadn’t and both of them had been lying to me the whole time. I’ve since forgiven them for this horrible deceit). Anyway, I was a little edgy and Scott kept telling me to “go bigger, go bigger.” It was frustrating to say the least. Finally, I said to myself, “He’s never going to let up until you look like a complete idiot.” With this new realization, I transformed Pippin into the most annoying, self-absorbed human being I could imagine . . . and Scott loved it. You want to get on Scott’s good side? Annoy the heck out of him. Laura Beard Aeling is quite the bohemian. She's a performing artist. She's a visual artist. She's a creative talent. At the time we were doing Pippin, she worked for a company that made large, blow-up, three-dimensional versions of Edvard Munch's famous painting The Scream. 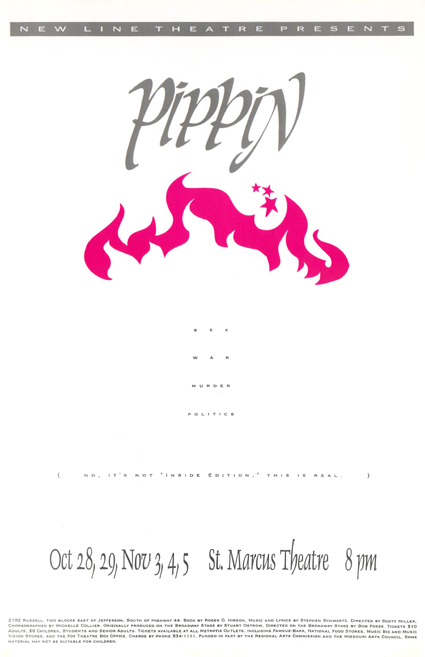 On the first night, the cast gathered for the initial read-through of the script for Pippin. In addition to the older, crustier veterans of New Line, there were new faces. Matt Kearns, Skippy Kastrup, and Beck Hunter were the young kids of the crowd. Fresh-faced. Impressionable. Wide-eyed. The cast was asked to take turns in sharing their names and something about themselves with everyone. Laura announced that this was her second New Line production and that, “I make designer inflatables.” The three young cast members glanced curiously at each other and then at me. As Laura continued, I said to the rookies, “Sans orifice.” Laura, without taking a breath and in the middle of her sentence turned to me and said, “Philistine,” and went right on with her introduction. I wanted to do Pippin to shut up all the people who were always telling me what a silly, shallow piece of irrelevance it is. I think it’s one of the best of the American musicals, and not just because of Bob Fosse’s original choreography. The more I worked on this show, the more I understood that this is not a show about Charlemagne’s son; it’s a show about a spoiled, aimless college grad trying to find himself in the morally and emotionally barren landscape of modern-day America. Only from that perspective does everything in it make sense. And my other revelation – that the entire show must be happening in Pippin’s head, that in fact he is his own tormentor – seems to be the only way this show works. Yet I’ve never seen anybody else do it that way. Because the original was full of razzle-dazzle, people missed all the red meat in it. It really does work when you let it, when you respect it. Pippin is a rich, complicated, smart piece of theatre about a very real, very flawed central character that addresses some extremely important issues in American life. And I’ve realized, after doing Pippin and other overly maligned shows, that most of the time when people blame their mediocre productions on mediocre material, it’s almost always the production’s fault and not the material’s. I have found again and again, with Pippin, Anyone Can Whistle, Assassins, Passion, Songs for a New World, and Floyd Collins – all shows that have been heavily criticized – that if you give a show your greatest effort, your greatest and deepest thought, and if you always assume a problem is yours and not the show’s, the show will often reveal itself to be the masterpiece only the fanatics knew it was. One of my favorite memories of Pippin was due to one of the disadvantages of the St. Marcus Theatre. Because the theatre was in a church basement, the ceiling was fairly low, and because the stage was raised two feet, it was only nine feet from the stage floor to the ceiling. Adding to that, Kevin Collier, who played Charlemagne, was six-foot-eight. So poor Kevin had to really watch for any lights hanging above the stage. In one extended musical scene, “Spread a Little Sunshine,” Kevin had to enter and exit the stage several times. In rehearsals, each time he’d enter, he’d walk onstage and – bam! – slam his forehead right into one of the lights. It happened every night, every entrance during this scene. The first time we were worried if he was hurt; every time after that we’d all giggle like third graders. It was just such a ridiculous sight. (I’m not sure why we never thought about moving the light.) Somehow, he finally learned to avoid it and I don’t think he ever hit that light during a performance.